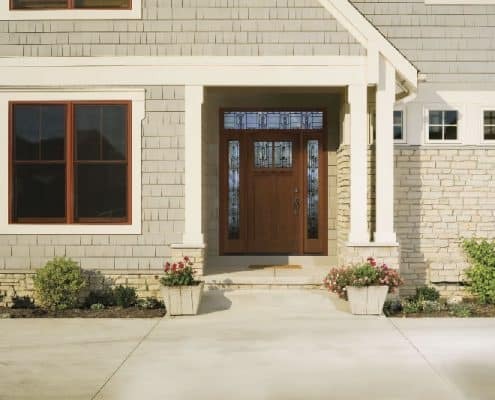 As the focal point of your home, the front door should look great, but it also needs to stand up to everyday use—and the elements, like rain, wind, and snow. Over time, you might notice sagging, dents, or peeling paint, or even drafts that sneak past worn weatherstripping—that’s when it’s time to call Weather Tight. 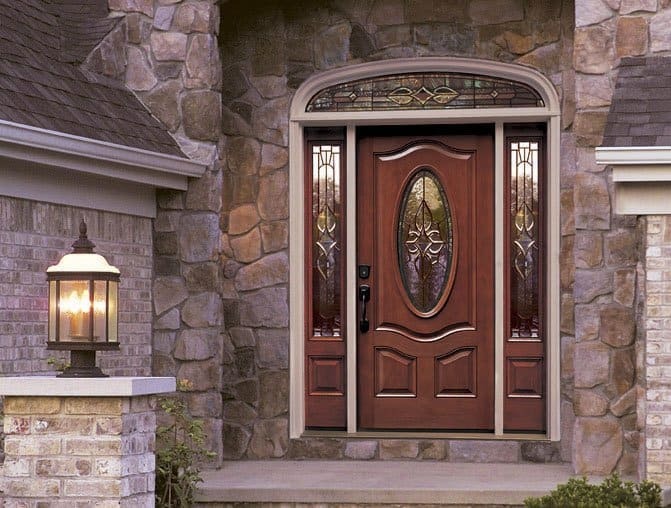 We offer a huge selection of Seal-Rite Doors that combine beauty, energy efficiency, and security. 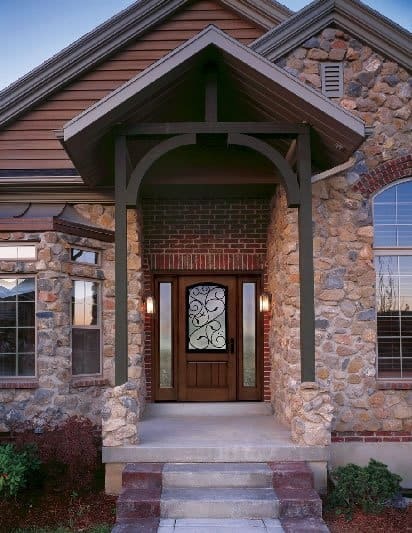 Our pros can help you find the perfect door for a great entrance, every time. We know how important locks are when it comes to protecting your home. The Seal-Rite Doors we recommend and install feature a highly secure locking system with three critical points of contact for extra safety and durability. 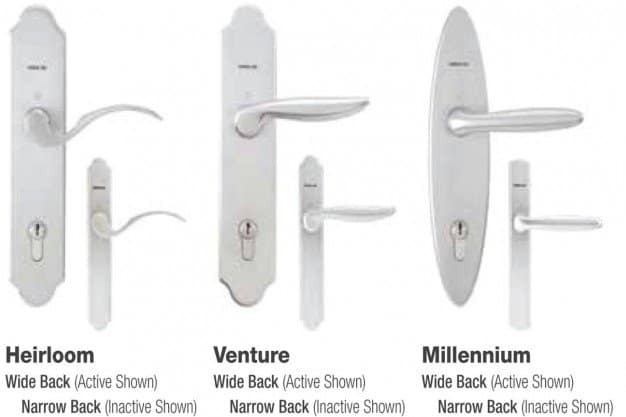 Instead of the standard handle and deadbolt lock at the center of the door, these systems use multiple deadbolts at various heights to deter a burglar. The best part of working with our pros is the Weather Tight experience. 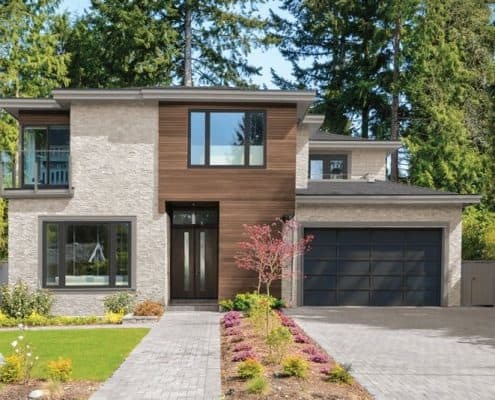 Measurements need to be exact and architecturally correct to ensure your door is plumb for decades to come—and we’ve got it covered. 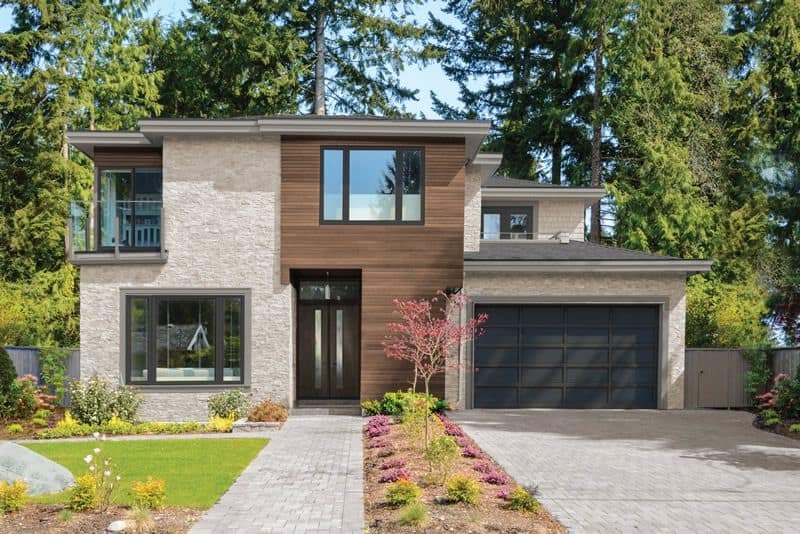 We’ll measure everything during the initial consultation, make recommendations, and walk you through the design process from start-to-finish. We’ll even recommend kick plates, mail slots, or peep sites that you might not have considered, but will come to appreciate. 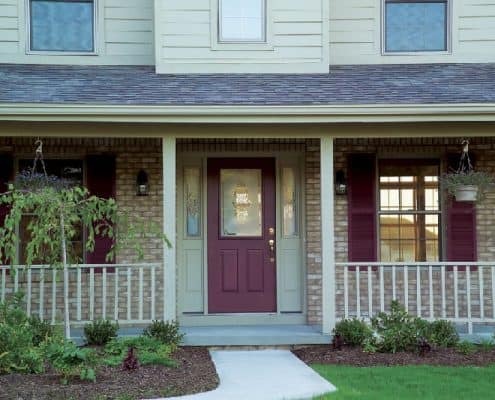 To start your front door update, schedule your free consultation today and start designing some options online. Design Your Custom Door Now! Installed by Therma-Tru Certified Installers. A distinct honor that our installers have achieved by completing a rigorous installation training program. Doors must offer security and beauty to be effective. Weather Tight has a family of entry and patio doors that offer both. Above and beyond the security you desire, Weather Tight offers an array of products to help keep your home safe from Wisconsin weather, and our doors are no exception. 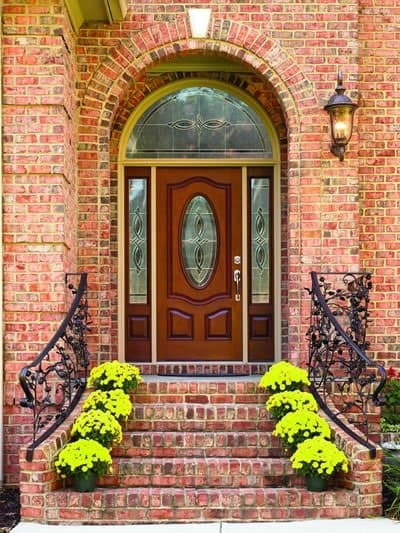 Fiberglass is the best material for entryways. It provides you with the look of wood and the strength of steel, allowing you to enjoy the benefits of both. It also provides energy efficiency while resisting denting and scratching. 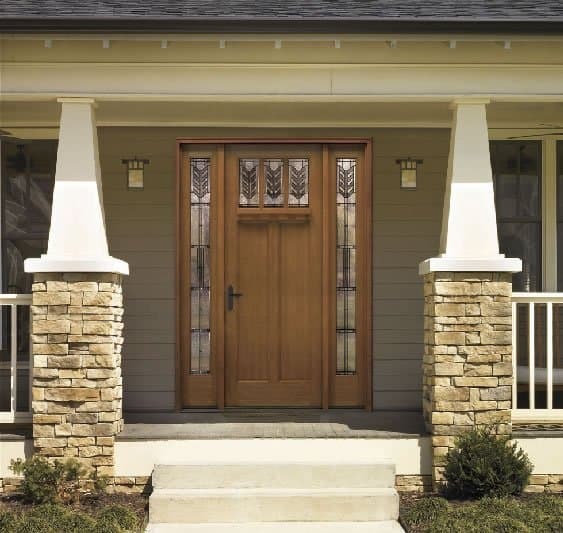 Fiberglass doors will not rot, deteriorate or rust and offer a realistic wood grain look. 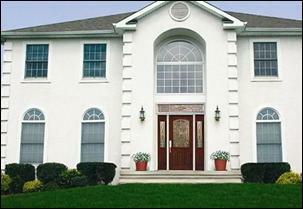 Fiberglass doors can be painted and/or stained and are five times more insulated than wood doors. These doors will not warp, twist or bow. Out of the three options, wood, steel or fiberglass, fiberglass requires the least amount of maintenance and is secure and energy efficient. Weather stripping is essential to keep your home protected from the elements and to keep the seal as tight as possible. Restorations patio doors come standard with quad seal weather stripping, which provides twice the amount of protection against drafts than the average weather stripping used in patio doors. ThermaTru’s weather stripping provides a stronger seal to reduce drafts than the average weather stripping. No matter if you are looking for patio or entry doors; Weather Tight offers products with draft resistant weather stripping. When considering your safety, having glass in your door may not seem to be the logical choice. Glass can break, however ThermaTru offers impact rated glass, in some models, which provides the beauty and light associated with glass and the safety of a standard entry door. When considering replacing your doors, the style and look of the door is an important deciding factor. 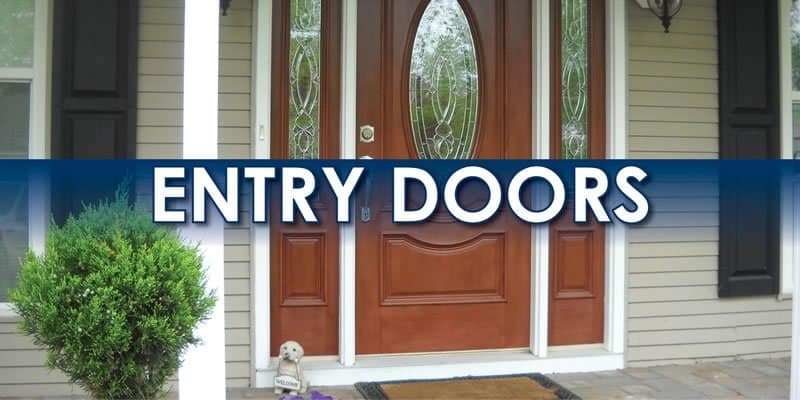 Entry doors from Weather Tight provide beauty and elegance to your home. We have thousands of color and glass combinations. This page is a representation of a few of the options. To see all of the options available, request a free in-home consultation. 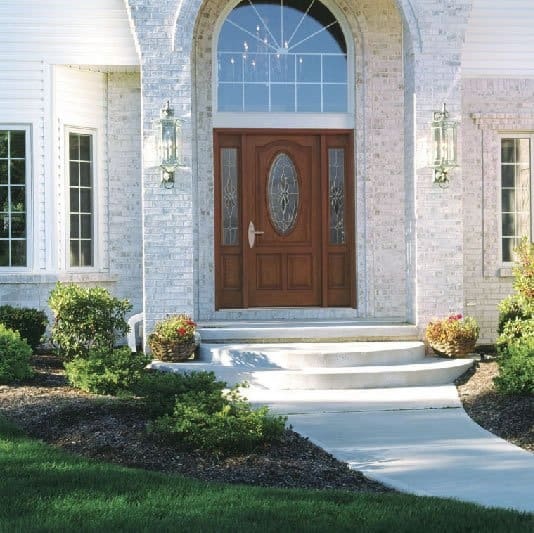 Weather Tight doors use a door casting process called AccuGrain that uses multiple dies that create different grain types to ensure the look of real wood on the fiberglass doors. After the door goes through this process it is indistinguishable from a real wood door. 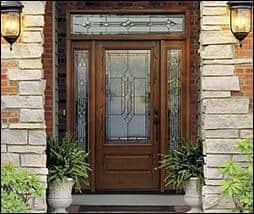 There are more benefits to having a fiberglass door over a real wood door, fiberglass doors will not split, crack, or rot like a real wood door does. We offer seven different stain colors to match the wood grain shades and the architecture of your home. Whatever stain color you choose the stain will resist fading, bleaching and chalking. Matching the same day stain shade of your choice with the highly detailed AccuGrain process will make it almost impossible to distinguish that your door is not real wood, except for its incredible durability. If you are looking to replace your door with a painted wood look, look no further. Weather Tight offers the Smooth Star series of doors through ThermaTru. These doors offer the wood grain look that is fully paintable. 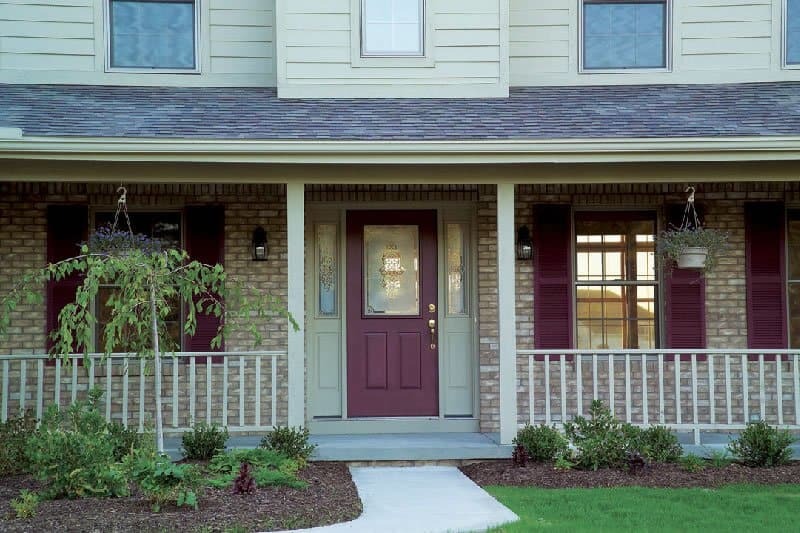 The color choices are endless; simply choose any Sherwin Williams color to use on your new entry door. 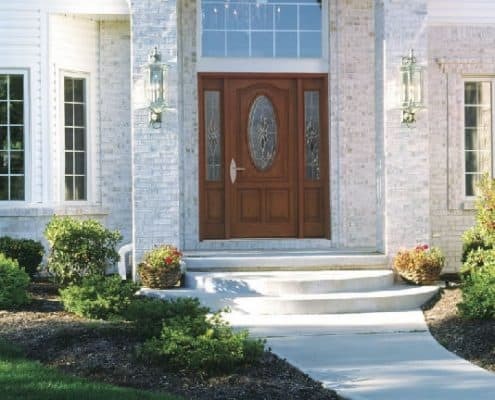 Smooth Star doors are made from fiberglass, which offers you all of the benefits of steel and the beauty of wood. Want more than just a door? 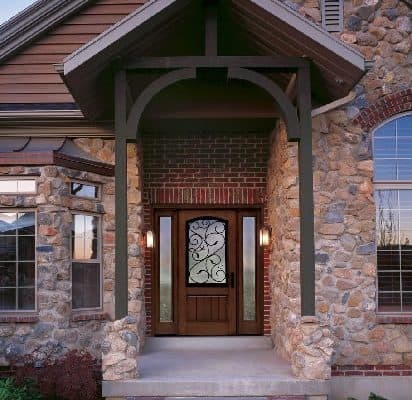 Sidelites and transoms add extra detail, windows, and beauty to your entry door. Purchase them together and increase the value of your home. Take a look at the pictures below and see how quickly a ThermaTru entry door system can increase the beauty of your home. 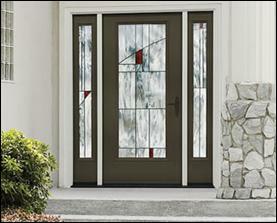 Bring beauty to your entry door with ThermaTru’s decorative glass options. Choose from a number of different styles to fit the style of your home, and then choose from glass styles such as frosted, water glass, and more! There are many styles to choose from. Use the door builder to build your door and see all the great glass options available. 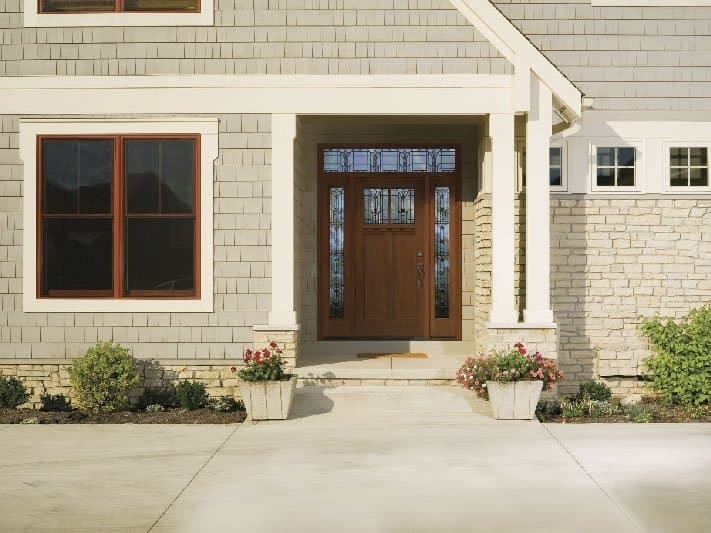 Our attractive storm doors are a great compliment to a new entry door. OurSpectrum™ Storm Doors feature retractable screens at both the top and bottom providing more venting options. 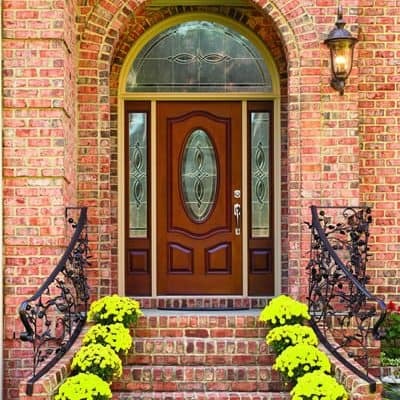 The Decorator™ Series offers stylish designs for instant curb appeal. The Deluxe™ Series storm doors offer multiple options for full screens or top screens. The Duraguard™ Series storm doors are ideal for keeping children and pets safely inside, with heavy-duty, non-removable stainless steel screens. The Superview™ Series provides style and value. The durable, oven-baked polyester finishes are backed by a Lifetime Warranty for lasting beauty and low maintenance. All of our storm doors are constructed with tempered safety glass. Each door features quality stylish hardware that adds beauty and functionality to your new storm door. The options vary by model. Smooth function is essential. That’s why we include a quality door closer in every storm door package. The options vary by model. Several attractive color options available. 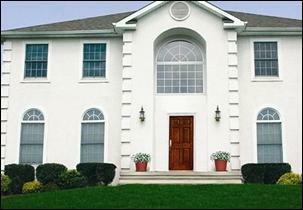 The ThermaTru Fiber Classic and Classic Craft Fiberglass doors both include a lifetime warranty. The warranties cover material and workmanship. You can read the full details of the warranty offered by ThermaTru by clicking the links of the selected style of door. Fiber Classic Warranty. View Full Classic Craft Warranty. 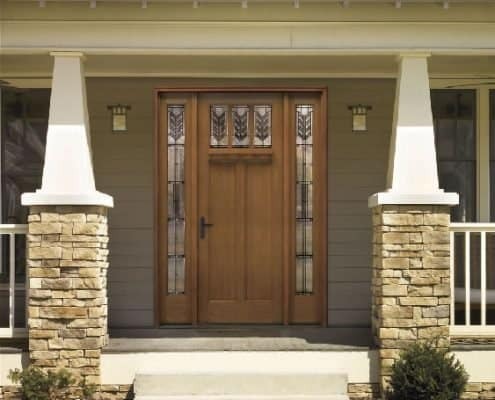 In addition to the wood grain fiberglass doors, Weather Tight offers a lifetime warranty on the Smooth Star Fiberglass entry door. This warranty is also held with ThermaTru and covers materials and workmanship. View Full ThermaTru Smooth Star Warranty. Is your entry door drafty? Did you know that having as small as a 1/8 inch gap under your entry door could be the same as having a 5 ½ inch diameter hole in your wall? By having a drafty door, the air that has been heated or cooled in your home is simply slipping out the door and taking your money with it. Replacing your old, drafty door with an energy efficient one saves money on your energy bill and keeps your home safe and secure. In 2010, ENERGY STAR®, through the department of energy, raised its standards and criteria for energy efficiency requirements for entry and patio doors. 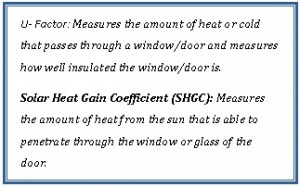 Doors must meet lower U-Factor and Solar Heat Gain Coefficient numbers to be considered ENERGY STAR® rated. With stricter guidelines for 2010, you can feel confident that your ENERGY STAR® rated door will keep your energy bills down. Therma-Tru entry doors and Restorations patio doors have both met, and exceeded, the new 2010 criteria to be ENERGY STAR® rated doors. Besides the insulation properties of a door, weather stripping helps ensure the door is sealed tightly every time it closes. Restorations patio doors come standard with quad seal weather stripping, which provides twice the amount of protection against drafts than the average weather stripping used in patio doors. ThermaTru’s weather stripping is stronger than the average weather stripping and provides a much stronger seal to reduce drafts. No matter if you are looking for patio or entry doors Weather Tight offers the products with draft resistant weather stripping.